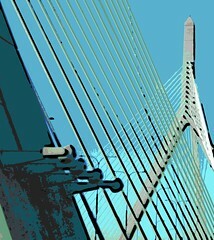 This is another digital woodcut, created from the same photo of Boston's Zakim Bridge. (See posts from the past two days.) I also made this image in Painter IX, but this time I used a color set. I think I like this one the best of the three.